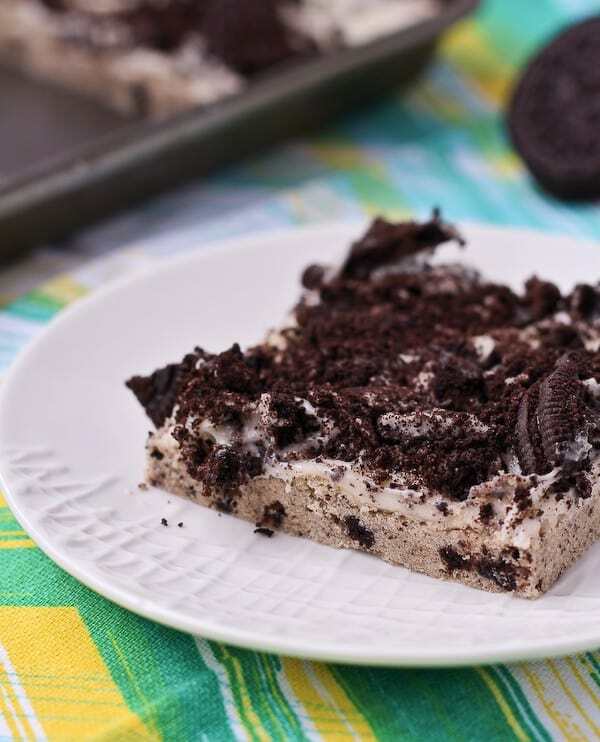 These Oreo Cookie Bars have a sugar cookie base loaded with crushed Oreo cookies and they are topped with cream cheese frosting and more crushed Oreos. 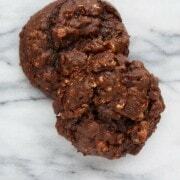 They are a crowd pleaser! It’s only fitting to finish out our week of flatbread week with a dessert flatbread, right? We could probably split hairs and call these cookie bars but we’re going to go with “flatbread,” ooookay? 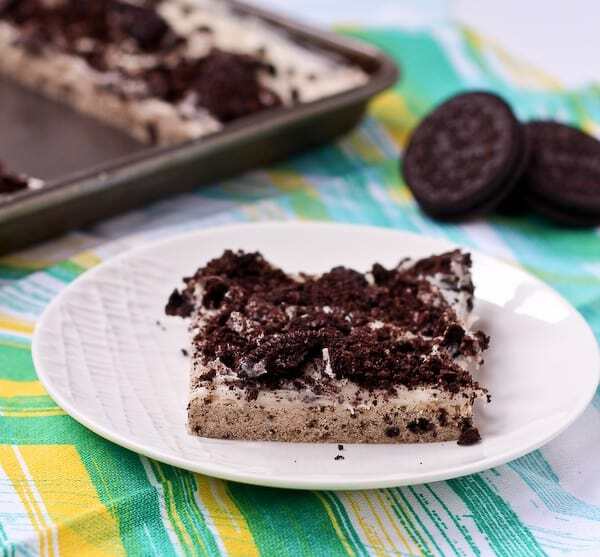 These Oreo cookie bars…err…flatbread are phenomenal. If I do say so myself. I used a homemade sugar cookie base but I incorporated crushed Oreo cookies into it. Then I topped that with cream cheese frosting (undoubtably the best kind of frosting) and then, of course, more Oreo cookies. You know dessert pizza? It’s always at potlucks and stuff? Sugar cookie with some kind of frosting and then fresh fruit? That’s well and good…but this has Oreos and cream cheese frosting. A perfect substitute for the famous dessert pizza, especially in the winter when you can’t get juicy berries and beautiful variety of great tasting fruit. Oranges, apples, and grapefruit. Allll winter long. These cookie bars are screaming for you to grab a glass of cold milk to go with them. Listen to their plea. Preheat oven to 350 degrees Fahrenheit. Spray 12×17 sheet pan with non-stick baking spray. Roll or press crust into the pan. Bake for 13-14 minutes or until just golden around the edges and set in the middle. Let cool completely in pan. 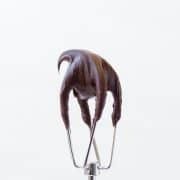 Once cooled, prepare frosting (“sauce”) but mixing all ingredients with an electric mixer until combined. Spread evenly over cooled cookie crust. 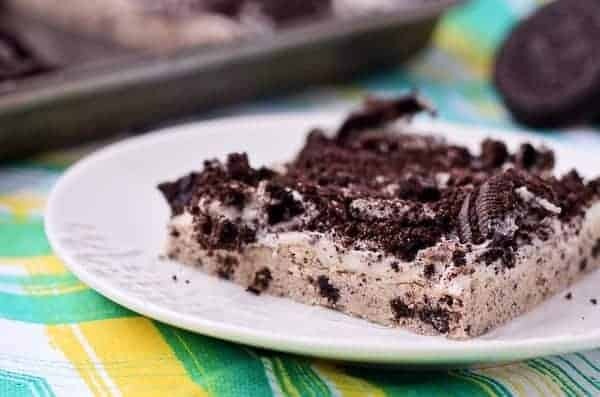 Top with crushed Oreos and cut into desired size pieces. 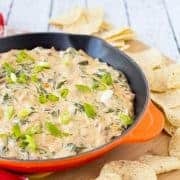 Serve immediately or store in refrigerator. Husband’s take: He loved these too — what’s not to love about this? Kids loved them too, obviously. They both have a major sweet tooth. I love Oreos so this is a no-brainer for my and my belly! I am definitely saving this baby. Thank you! Love these bars! Such a great dessert. An Oreo lover’s dream come true! Love the idea of this Oreo “flatbread”! These look so good! That’s my kind of pizza! ohmygoshhhhhhh yes!! Oreo pizza is officially necessary in my life! After reading the title I wondered where you were going to go with this. Well in my opinion you went to a GOOD place. Pretty sweet! 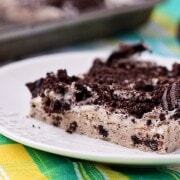 I’m an Oreo fiend…this is happening in my kitchen asap!! This is very unique! These cookie bars look awesome! Uhmm..Hello SUPER CREATIVE! I would have never dessert-i-fied flatbread! But, I love me some dessert pizza so this sounds like it’s right up my street. Plus oreos? Any day, any way. Pinned!